Remember that? The group I joined to try to finish up some of my languishing WIPs? Yeah… since then, I started and finished three new projects (my green cowl, and the hats I made for my brother’s two friends). So, the WIP pile… has not really moved. But, that has changed! I finally dug out my Boteh Scarf once again. It’s been forever since I worked on it, partly because, um, I lost it for a while. I’ve gotten several more motifs done in the last week, though – it’s like, scarf-size! The pattern calls for an edging, but I decided not to put it on this one – I like the way it looks right now, and this way I can just keep working until I run out of yarn. Kris and I were watching Bones a couple of weeks ago, and in one scene Brennan was wearing this really cute hat. I decided to try to recreate it. I’ve been working on it since, and have been fighting with the decreases for the last two weeks. I just wasn’t happy with them, in spite of ripping them back a couple of times. I’m trying again after making an adjustment to the design. I dropped back the small cable and made it a 12-stitch cable bordered by 2 purls on either side instead of a 6-stitch cable bordered by 5 purls on either side. If I can get the decreases to work the way I think I can, it should be better. And maybe even finished soon-ish. 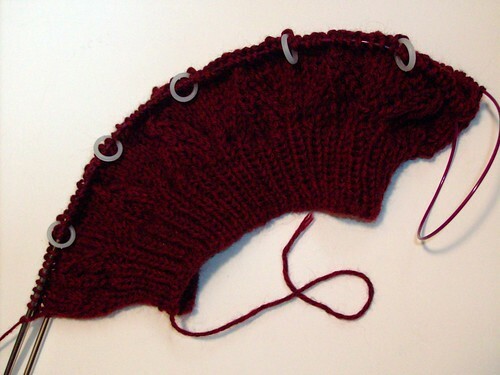 The other new project is a hat (yes, I’m hat-obsessive lately…) that I’ve been thinking about for a while. See, Carrie has this really cute slouchy grey beret that I’ve been wanting to recreate. So, last night at dinner, I grabbed my notebook and charted out the lace pattern. 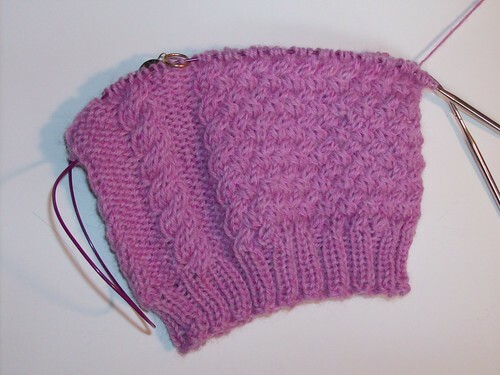 Of course, she told me that she thought it was the same pattern as Wooly Wormhead used on the Meret (Mystery Beret). And yeah, it mostly is. 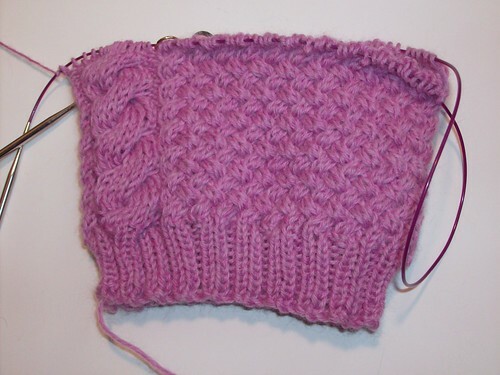 But that pattern wasn’t quite what I wanted mine to be, so I am using the lace stitch in my own pattern – tubular cast-on, ribbing, and then the lace. I think I’ve got it mostly planned out. If it keeps moving this quickly (I’m on the third repeat of the lace already), it should be done soon, too. Might make a cowl or mitts or something to go with it, since I’ve got three skeins of this color. 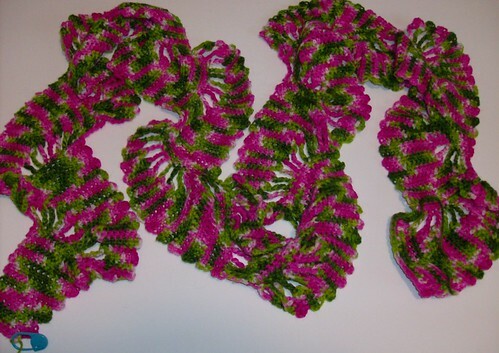 February 20th, 2009 | Tags: Crochet, Finish or Frog Fridays, Knitting, WIPs | Category: Misc. oooh, I love them all! Especially the Boteh! Great colors! Woah, that Boteh looks like a psychedelic amoeba! Both of those hats are going to be stunning!!!! I likes the modded hat with the bigger cable! Meshes fabulously with the basketweave! The wider cable is definitely better. It is looking really good.